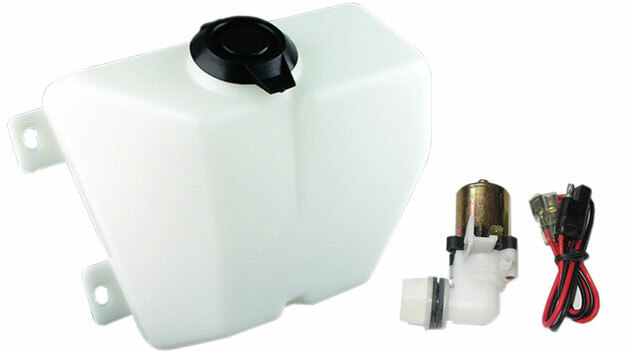 New Washer Bottle with Pump for 68-70 Ford Broncos. This is an OE correct washer bottle for your early Bronco. Includes pump and wiring. Mounts to the factory location on the front of the wheel well. Received my shipment quickly and it good order. I?ve installed my new windshield washer reservoir and it looks and works great! I recieved my parts in good condition. For the life of me, I cannot figure out how to get the nut on the pump. I apparently don't have the right tools and my hand is obviously too large to fit in the bottle hole! I am sure there is a trick to it. I ordered the kit all together instead of individual parts thinking it would be easy to assemble or come put together. I was wrong on both counts. ***NOTE FROM TBP - Thanks William for the review and for sharing your concern. We have uploaded a video to this page to help you and others to understand how to connect the pump to the bottle and the tools needed to do so.